FlyRecorder allows you to make high-quality audio recordings directly from your sound card. 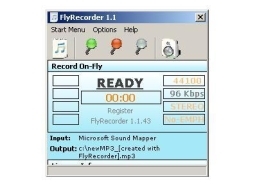 FlyRecorder can record streaming audio (like internet radio) directly to MP3. This saves disk space and gives you files you can easily download to an MP3 player. Also some other great features of FlyRecorder: Audio Converter, Live Broadcast (gives you the ability to broadcast your music to the internet with your favorite music player). Direct to disk ability allows you to record sound without running out of memory. FlyRecorder records directly to the mp3 format, saving you valuable disk space. You can select the different mp3 recording modes as required. FlyRecorder's interface is easy to use, and well-suited to both novice and expert PC users alike. FlyRecorder Convert option, is a new feature that replaced the old WAV to MP3 menu. With this new audio conversion feature, FlyRecorder has now the power to convert the following audio files between them: WAV to MP3, WAV to OGG, WAV to WMA, WAV to APE, MP3 to WAV, MP3 to OGG, MP3 to WMA, MP3 to APE, OGG to WAV, OGG to WAV, OGG to WMA, OGG to APE, WMA to WAV, WMA to MP3, WMA to OGG, WMA to APE, APE to WAV, APE to MP3, APE to OGG, APE to WMA. Qweas is providing links to FlyRecorder 1.6.3 as a courtesy, and makes no representations regarding FlyRecorder or any other applications or any information related thereto. Any questions, complaints or claims regarding this application FlyRecorder 1.6.3 must be directed to the appropriate software vendor. You may click the publisher link of FlyRecorder on the top of this page to get more details about the vendor.